The garden. Oh my goodness, the garden is so full of color right now - color and volume and oh so many things needing to come in and be properly taken care of before Mr. Frost makes an appearance (I've been lucky so far). This weekend, I think, that will be the big push from garden to kitchen! We've had - for the first time since Greta joined us three years ago - some loss (birds) due to a fox. That sneaky fox is coming in the broad daylight, when they know that Greta is napping and catching up from her night shift of guarding the livestock. Smart Greta knows this is going on, though, and has taken to only sorta-kinda-sleeping in small stretches. Yup, she's working doubles until that fox gets the idea! We're loving her up and spoiling her with gratitude, of course. This is a serious case of "If I build it, can they come?" on the part of my children. They, being bunnies. Inspired by new bunnies at a friend's house, they're convinced that's what this farm is missing. Papa is not convinced. I'm still deciding how I feel about that. But they're going ahead with building plans and are rather optimistic. At least there is team work happening! But maybe an Angora bunny could be a compromise I could live with? I've been enjoying both of these cookbooks in recent days, as I begin to replace some of our favorites with gluten-free options. I haven't done a lot of flour substitutions or baking yet, though I know winter will bring that urge. Any cookbook recommendations for me in the Paleo/Gluten-Free vein? I'm all ears! Late to the party, I'm also really loving Beatrice's website, La Tartine Gourmande. So much goodness there! I was remarkably restrained at the fair in my fiber purchases. But I couldn't leave without something from Hope Spinnery, the wind-powered fiber studio that uses all natural dyes. I LOVE the colors that are created there, and this purple duo managed to come home with me. Not sure what it will be yet, but I'm excited to cast on for whatever it may be soon. I'm knitting. Like, a lot. Like, it's all I really want to do even though I don't really have a whole lot of moments this month to knit. But I'm feeling it - that pull in, that desire to sit down by a warm fire and knit for hours! You too? This kid has a ballet show this weekend. He'll be Prince Ivan in the Firebird and I can't wait to see it. How do they become young men so quickly, right before our eyes? Last night, I found him like this, sitting on the kitchen table putting off the dinner dishes. "I like that one," I remarked after listening for a minute. "Who's that by?" not recognizing the song. "Oh, that's one of mine," he casually informed me. Is being a Mama not the best job in the world? So grateful I am. Another year passes at this turning of the seasons and with it comes another beautiful Common Ground Country Fair, and another successful Taproot weekend within the fair. I was remarking a few times over the course of the weekend about how very reliable and dependable the fair is in its consistency (this being the 40th anniversary and all). This belongs here, that can always be found there, and this is how it goes! It makes the most subtle of changes (where'd my gelato go? And why is there a new voice at the microphone as the fair announcer? ), so much more pronounced. In the Taproot Booth, we noticed and greatly missed our regulars, but welcomed some new folk into the fold. We spend so much time together as a crew during the stretch of days there, it's fast and furious way to get to know one another, or to connect in a different way on a 30 year old friendship. There is a lot of hard work in making that tiny little 10x10 booth happen, and the days are long, but we have so much fun. And it's made all the most joyful and rewarding as we meet people all day long who are kind, supportive and encouraging about what we do. I always leave the fair both equally inspired and encouraged...and exhausted. Huge thanks to the crew (pictured and not) who made this weekend a much easier one on me than ever before. Easier enough that I planned on spending most of Sunday away from the booth, with the arrival of my family for their day at the fair. But not a half an hour after their early morning arrival, Steve and I found ourselves standing alone in the middle of the 20,000 or so other people attending that day! Each of the kids scattered off in different directions, with friends or older siblings, and were happily and independently enjoying their time at the fair (and spending every penny of their allowance on treats and treasures). A little lost - Steve and I have never been to the fair alone! - we puzzled over what to do. The first thing we each thought about was finding a quiet spot to take a nap. Ha! But instead we walked and talked and shopped for axes. So romantic. Or at least, so lovely in the time together before we joined up with at least the little ones for much of the rest of the day. It's a beautiful thing, this wonderful marker of time that we have within the fair. It is a constant in our lives, and yet within that come some subtle changes and shifts that represent and reflect the shifts and changes in our day to day lives and growing families. And as a marker of the near-end of harvest season, it always provides us with an opportunity to pause in gratitude for it all. Until next year, Common Ground Country Fair! I have much to share from the fair, but before I do that I have to tell you what the final decision was on what to bring for knitting! I grabbed the yarn for making a Gidday, because the draw of a new project was just too appealing. And as you can see, I got so much done! Ahem. But those few stitches in all those days are a sign that the fair was a busy, full and very good one. So hooray for that, and the idea of getting home and perhaps lighting our first fire a bit early (such a chilly weekend it was) and knitting right there. Ah, yes. And all these extra photos to show you a whole lot of nothing? That's a shout out to Calvin who, with a friend, spent an evening here with me at the rental house. I casually remarked how much I love this door, and look forward to seeing it every year. And well, he was mystified to say the least. But we did add 'patina' to their vocabulary lists, and who knows, maybe someday, he'll use it in a sentence about just how much he loves an old wooden something or other. You never know. Wishing you a wonderful start to your week, friends! Ahhh, fall! I know there are so many that cherish summer right to the last drop, but unless I am physically in the lake, I am not one of them. When I am hot, I cannot always cool down (unless I’m back in that lake). But when I am cold, there are wood stoves, and sweaters, and wooly skirts, and leg warmers, and so much more. Maybe that’s what led me to making woolen clothing? Not for my love of the cold, but for my love of warmth when it’s cold. So as the days grow cooler and the nights grow colder, my smile grows bigger. This year I have some of my old standby, thick warm organic merino for sweaters and dresses. But I’ve also got a thin drapey organic merino that makes for excellent leggings and flowy skirts and tops. It can also be thrown in the wash (on gentle and preferably in a net bag) and it comes out even softer, with negligible shrinkage. What a joy it is to wrap oneself in light weight warmth. And the new leaf green, the blue yonder, and the ruby red will keep you summer lovers dreaming of spring all winter long. But for now we prepare for the cold. We huddle together. We dream of warm fires. We reflect on friendship. We send out healing thoughts to those we love that need them. We prioritize. We do what needs to be done, and we return home with a sense of comfort. And each morning I pull on my favorite wool sweater, and wander into my living room. I stare at my woodstove longingly and whisper, “not yet, but soon”, as I wrap my fingers around my hot mug of tea. Kate: This year’s new wool comes straight from New Zealand merino sheep. It is light weight yet warm, and softens with each washing. It is organic and Oeko-Tex certified (a global certification for clean processing standards). It comes in three new colors and drapes beautifully. It’s always the leggings right? Everyone loves a pair of warm wooly leggings to go under their skirts, dresses, or tunics. It’s how we winter lovers get through the day unscathed. Enjoy a pair in your color choice and your size. Please enjoy 15% off your entire order by entering coupon code WINTERLOVER. Even if you hate winter and would prefer the organic cotton/bamboo clothing, I’m still happy to share the discount with you ;) Offer good through Sunday October 2nd. I'm sorry for disappearing this week! I feel as though I left mid conversation. I mean we were talking about important things like what knitting to bring on a near week-long adventure. Important! Unfortunately, I got swept up in less exciting decisions like how to get a few thousand magazines from Burlington, VT to Unity, ME when Plan A fails and there are only 24 hours left before the fair opens. And other things like that. But we are here! And so are the magazines! And so is the amaranth! And so is help, in all the many forms that it appears - from colleagues to strangers, from friends to my friends' children. I am reminded over and over of that - the way that it takes a village to do much of anything, really. So grateful I am for that village. And so grateful I am to be heading into a weekend celebrating just that - community, connection, and common ground. If you're headed to the Common Ground Country Fair, I hope you have a most wonderful time! And if you'd like, please do stop by to say hello (and see what I brought for knitting! ), grab a magazine, and enter our fun daily raffles. We'll be in the media area, eager to say hi and to sit a spell with visitors. Wishing you all -regardless of where you will be - a great weekend ahead! Friends, I need your help! While I should be counting back issues and popping open that tent to clean off the dust from last year (so dusty it was, please let it not be this weekend! ), instead I am focusing on THE most important packing decision I have to make for the coming week away at the fair. And I'm having no luck. In fact, I'm only coming up with more options the more time I have. Tell me - what knitting to bring? Of course, most exciting is the next knit, always the one yet to be cast on for. This will be Gidday, for Annabel, in my own yarn with a flash of color from the dyed wool I've been making this summer. It is again a pattern, but not a complicated one and I think I could swing it for sure with that easy starting garter yoke. But then there's the trouble of not having a gauge yet, nor having wound any of this yarn into cakes yet, nor having even decided on the final color. Oatmeal and rusty orange? Oatmeal and yellow and green? Oatmeal and all three? I'm not sure I'm ready for this kind of commitment yet. It feels rushed. Then there's always the option of picking up any one of these 'unfinished project' bags (there are more, I'm too embarrassed to show you all of them) and finishing something that's been lingering for a good long while. That's always such a satisfying feeling. But also, a bit daunting to dive back into sometimes - I mean, there's a reason (for each one) that they were put down (and forgotten about) all that time ago. And then there's this. Not something I would usually consider bringing with me, but it does fit the bill of being something I can do while talking (garter stitch! and more of it!). AND, the forecast looks a bit chilly this weekend so this could definitely double as a blanket while I'm knitting it which sounds incredibly cozy. But, it's, um, huge (it is a blanket, after all), and might it be a bit antisocial to be snuggled under a blanket in my Taproot booth? This introvert can't tell for certain but is thinking perhaps yes. That isn't exactly approachable or open to new conversation. Hmn. I mean you all might understand, but perhaps not a stranger. And round and round I go! Further from a decision each time I consider another option! I could just grab a quick couple of oddball skeins and get some simple hats or mitts done. That could work. I could bring it all (and totally would, in a heartbeat, if I had an extra square inch in my super-packed rental van). OR...I could throw all caution to the wind, grab my bag of needles, and wait until I get to the fair to be inspired by some yarn I see and buy there, and a project that just 'comes' to me. That's pretty risky behavior, I know. But on yarn, I'm willing to take some chances. I was chatting with someone local recently, talking about our plans for apple picking later in the week. "You know," she said, knowing us as she did, "there's an orchard not five miles away from you and they do not spray their apples." Oh really? Hmn. Well, perhaps we will try that out someday (and maybe, possibly, someday, our own 'orchard' will grow enough for us! ), but goodness we are deep in our tradition and ritual and the mere suggestion of changing it brings family revolt like you cannot imagine! And so we find ourselves venturing each year to Ricker Hill, not all that far away really. Enough of a drive to build some excitement and anticipation, that's for sure. For the jug of apple cider and dozen cider donuts I buy at the bottom of the hill before making the journey to the top of the hill for the organic picking. It hasn't been a great year for apples here in Maine, which we are well aware of. Our own trees produced just a few, and the old trees we've been nurturing here and feed the pigs with each autumn, are low in quantity, indeed. So dry, so hot, so little water we had all summer. But! The experts up there at Ricker (8th generation, I do believe), have plenty and we enjoyed the picking, the donuts (well, some of us), and the cider. And as always, a stop at Nezinscot Farm for lunch, where I could sneak away and admire some fiber while we waited for our delicious farm lunch (if you're ever in that neck of the woods, do stop by - you'll be so glad!). And then home, to a busy weekend that leads into a busy week ahead. The Common Ground Country Fair is ahead! In the past five years it has shifted (for me) from a lovely day of celebration of the harvest season and community, to a lovely week of celebration and work and commmunity, in such a busy season of home life! I find myself scrambling to harvest everything I can right now, always worried (rightfully so) that a frost will come while I'm away. It does look possible in the forecast. And so it is that I find so many big, round, red and delicious things in the kitchen from morning till night. Tomatoes and apples, mostly. I've got no more time for fancy apple butter or salsa...instead it is simple passata in the oven then quickly pressure-canned, or apples cut in quarters, cooked down, run through the mill by whomever is walking by that I can coerce into such a task, and then steam-canned for applesauce. It's Get Serious time in the kitchen, my friends. Since we're talking kitchens and food, I wanted to say thank you for your kind words and helpful tips last week when I mentioned the newly discovered presence of celiac in our family. It is I with the diagnosis, though I have my suspicions about one or two littles that only the blood test will confirm soon enough. It has, indeed, been a sudden change, but truly if one were to go gluten-free suddenly, I would highly suggest you do so in the month of September when the garden bounty is so plentiful that all you want to do is eat fresh and delicious vegetables anyway (with a side of protein, thanks to that slowly-filling freezer)! I haven't missed a thing yet, and am only enormously glad for feeling 'better'. Forget those apple cider donuts (pretty though they may be), a happy body is more than a fair trade-off. (Though I will tell you that when friends delivered me a beautiful cake from Bam Bam, a gluten-free bakery, I was overjoyed with that taste!) Since Mama is mostly the cook, it seems we've all suddenly adopted a gluten-free diet which has really been just fine. Again, September spoils us. I do wonder how February will be, and what will fill the void of chicken soup with dumplings, but thanks to all of you, I have a whole list of references and resources to begin looking at when I'm ready to start 'replacing' that gluten. Truly, thank you. And yes, though it is all new to us, I will surely take you along the journey if I learn anything useful or helpful along the way. And now...there is a cup of black tea and a steaming bowl of applesauce waiting for my breakfast before this full and wonderful September day begins, with plenty more apple and tomato preserving to fit into the pockets of our day. As always, I wish you and yours a wonderful start to your week! Fabula Nebulae is a small, family collaboration in beautiful mid-coast Maine. Our all natural skin care products for body, baby, and bath are made by hand in small batches. Come visit Fabula Nebulae on Facebook, Instagram and Pinterest. Pasaka: We had such an exciting, wonderful season - and we now have a farm with pasture, woodland, and a centuries-old orchard! The beautiful fields will eventually be home to our own organically grown flowers. We’re determined to continue moving toward completely organic, sustainable, eco-friendly products and packaging. In addition to our new homestead, we have a new (four legged) family member: Nora the Stabyhoun. Life is good! Fabula Nebulae celebrated its first birthday this August. And what a wonderful year it was! Our family business grown in a way we could never have imagined. We’re so thankful for the new friends and customers that we’ve met along the way, most recently at MommyCon in Austin, TX, and the Belfast Co-op here in Maine. Check out "Events and Expos" on our website, and by all means do stop by and say hello if we’ll be in your area! A $50 gift certificate to the Fabula Nebulae shop! In honor of Amanda and Adelaide’s recent birthdays, all orders placed this weekend will also receive a free sugar scrub! In addition, Fabula Nebulae is offering all SouleMama readers 20% off through the end of September with the code SEPTSOULE. Thank you for the chance at this fun giveaway!! Always nice to have an option with ingredients you can recognize! She was a remarkable woman till the very end, and I continue to hear tales of her last goodbyes - not dramatic or overly emotional, for she was neither of those things. But incredibly practical and loving, for she was those things with all of her being. Just recently my wonderful Aunt asked if I might be able to finish a pair of mittens that my grandmother began for her in the winter before she passed. My Nana gave her the mittens in progress, still on the needles, with an apology for not being able to finish them. Do you see what I mean? So practical! And loving, this woman! And so the ball of yarn was handed to my aunt, and now to me, ready to be finished, for Nana would never have wanted to waste time or materials. Indeed, that would be a great offense to her. There is no accompanying pattern because of course it is the pattern that is in her head after all those decades of making the same pair of mittens for so many people. Hundreds, easily, maybe more? And so, this is my challenge. A simple pair of knits that my Nana practically made in her sleep. With no pattern, though I think (hope?) I can wing it by looking at some finished pairs we have here (some in this post here) at home. And in yarn I'm not accustomed to but will most certainly knit with joy (or love, anyway). This isn't our first collaboration - we made so very many things in our time together. Beginning when I was so little that my 'help' amounted to rearranging the pins on the pincushions like my littles do now (or more painfully, folding the tissue paper pattern pieces back up just so - oh, I hated that job! ), to me taking the hand-off when she was unable to finish something (yes, we've done this sort of thing before! ), and now to perhaps this last little thing we work on together. Though of course her influence is in everything I do. As I write this now and find myself unexpectedly tearful, I have to laugh, for I know she would not be so overly-sentimental and surely instead humored by my tears (and a little bit touched, I know). Because really, it's a matter of Waste Not, Want Not, isn't it? Yes, that and Love. These things she knew, and I try too. There's been an increasing challenge of late as I call in whomever is responsible for setting the dinner table that day. The (beautiful) trouble of course is all the produce coming in from the garden! Though our kitchen table is a generous nine feet long, we really need every square inch of that for evening meals with eight. There's been a scramble each day as we try to find a place to put this tray or that basket of tomatoes, beans, cucumbers, peppers or whatever else may be coming in right now. In a pinch, with every available counter space already taken and tomatoes spilling into the library, Steve grabbed a folding table from the barn and quickly set up an 'incoming' table in the kitchen entry. Ah! Perfect! (And if I were ever to redesign a kitchen/mudroom here, which I don't think I'm actually doing, I'd certainly build such a garden incoming/prep spot somewhere.) Anyway, that quick fix got us through dinner alright, but with more coming in today, I knew it was time to get serious about some preserving this week, despite all the distractions and pulls in other directions. Last night I got to it, with a good audiobook for company (Circling the Sun), and every last pot/pan/large bowl/bucket I could find put right into use. Added to what has already been canned this summer, I think we're in really good shape for the winter ahead. I hadn't canned a lot of soup in the past years, but a recent celiac diagnosis in the family has us changing up some regular standby meals. Pasta, frozen pizza and all those other quick prepared things are in a state of flux as we sort out our favorite Gluten-Free versions of the same. Having canned soup for nights when I find ourselves in a dinner pinch is going to be so helpful, I think (I'm using the pressure canner for those, as I do for chicken stock as well). And speaking of canners, I purchased a steam canner earlier this year and have used it for some of my high acid canning. I know it's a controversial thing, but following the safety instructions to a tee and using a Ph tester as well, I feel confident about the recipes I've been using with it. The time (and water) it saves is rather remarkable, really. And I haven't had any breakage with it, which is a huge bonus. *Tomato Soup! I've made some using our standby classic recipe, and new to us this year but already a favorite, is the "Garden Special" recipe from Wing and a Prayer. *And a whole lot (enough so that I can say we're 'done' with canning relish for the year!) of the Classic Sweet Pickle Relish from Pickled Pantry by Andrea Chesman. *Also from that book, I made some Simple Salsa. This one is a bit thinner than our Soule-Sa (from The Rhythm of Family), but it's nice to have some variety in salsa on the shelves come winter time. *And last but not least (and the very thing that kept me up past midnight waiting for it to cook down to the right thickness), is Good Ketchup from Canning for a New Generation by Liana Krissoff. I'm glad to have enough tomatoes coming in this year that I felt able to make ketchup (which takes a whole lot of tomatoes to make not a whole lot of ketchup). The 6 pints I made certainly won't last us all year long, but it will be a nice treat for a little while. Homemade ketchup is really the best. Phew! So that was last night (I'm sparing you the morning dishes photograph because I really don't want to look at it either). I'd like a nap this morning, but don't see that happening. I do see the "incoming table" is only half empty after all of that and I know there is so much more ready to be harvested out there. Looks like I'm adding 'buy more canning jars' to the to-do list today! Oh, the bounty of harvest season and the joy - truly - of saving it. What's happening in your kitchen these days? Oh my goodness, I love this shawl. I loved every second of knitting it. Not only because I love this yarn (and am so glad I had my latest batch made into worsted weight! ), but because of all that perfect garter stitch in the pattern. It is so welcome in the summer time when I'm carting my knitting here there and everywhere, and often in conversation or distracted otherwise. It's been especially good for calming my nerves while sitting in the passenger seat as Calvin gets his driving hours in. (Truth be told, I needn't be so nervous - he's an excellent and attentive driver.) This shawl has been around the bend this summer, indeed. And now that it's done, the size is just right. It's cozy and warm and perfect for the cooler moments that the September days are bringing. The pattern is Leading Bird by Leah Thibault. And the yarn, well that's mine. I still have to pinch myself regularly that this is an actual thing I do - knitting wool that came from the sheep I share my backyard with. What a delight it is. Eleven years ago this month, I went into labor with Adelaide on my birthday, though it was still three days after that before she made her arrival earth side. As with any labor, those three days felt like one blurry moment, and I think that feeling has in some ways remained through the years. Our birthdays now blend right into one another with hardly a pause, except for the quick changing out of photos from mine to hers on the kitchen windows beneath the birthday banner. It suits us, really...my fellow Virgo, my (not-so-little) girl who I share so much in common with, this little lady who prefers intimate gatherings over large parties. And so it is that this birthday week has really become Beach Week each year, as that's where both of us want to be. We brought our best beach selves to the game this year, beach hopping each day as we celebrated not only my entry into a new decade but also her "golden birthday" (eleven on the eleventh!). Interrupted by a few pies and cakes of course, and maybe some ice cream cones too, we also were entertained for four days straight with Harper's on-repeat rendition of Happy Birthday created on his Snap Circuits (complete with hand clap/sensor for that repeat), and so many hydrangeas from Annabel that it's amazing there are any left on the plants outside. Skipping right on over the reality and bittersweetness that time is flying by "too fast" for me at this big year marker (but oh, I'm happy about 40, I really am), I was most definitely feeling that way with my baby girl (who is not a baby anymore). Eleven - from what I've experienced twice before with the boys - is such a big transitional year and I see it all beginning with her too. Exciting and fun changes and also some challenge and struggle! Don't rush it, baby girl. Don't rush these magical years, I'm always thinking and worrying when I see glimpses of what might be seen as growing up a bit too fast. But as I tucked her into bed last night, I noticed her hair had flecks of seaweed from all the wave-jumping we had done earlier in the day. "Oh, Ada....why didn't you take a shower to get all of that out of your hair?" I asked. Her eyes twinkled a bit (she's got a great eye twinkle!) and with a little giggle she said, "Well, I was thinking that maybe if I left it in my hair for the night, I'd turn into a mermaid." And I was reminded that I could worry a little less. She's just fine. And I know what she means, actually. These September days at the ocean are really something special. There's a golden light that makes everything glow, the shoreline is quieter than it was a month earlier, and as we stand in the ocean letting the waves wash over us, or run into them with our loudest voices, or whatever our preferred method of embracing the water, we can't help but wonder if this is our last time in for the year. And so we soak it all in and see it all clearly, just in case it is. And as surely as I am washed over with the feeling of being alive in that cold awakening water, I also find myself washed in gratitude for this crew at my side. We are very lucky birthday girls, indeed. Greetings from Simplicity Parenting 101 by Handmade Parenting! Simplicity Parenting 101 is a nine-week comprehensive online parenting class. SP101 combines work-at-your-own-pace material (pre-recorded video lessons, articles, podcasts and worksheets) with real-time interactions (live group coaching calls, a vibrant parent forum and thrice-weekly “office hours”), which makes the course convenient as well as vibrant. SP101 provides parents from all over the world with a chance to come together for learning, sharing, inspiration and support. Topics include: Clarifying your Parenting Values, Simplifying your Home Environment, Soul Fever, Family Rhythms, Sustainable Scheduling and Filtering Out the Adult World. Weekly live coaching calls, the lively parent forum, as well as hosted office hours give parents ample opportunity to connect with Lisa and the other parents in the class. Hademade Parenting is on Facebook, Instagram and Twitter. Lisa: I have been teaching popular parenting classes in Portland, Oregon for several years. After receiving many requests for online classes from parents outside of Portland, I decided to create Simplicity Parenting 101 as a seven-week online class which launched last Spring. The deal I made with myself was that if the online class didn’t have the same intimate, supportive and community-building ‘feel’ as my in-person classes did, I would let it go after the first round. But guess what? It was amazing! Parents from all around the country connected, learned, grew, changed, supported and generally joined together to root more deeply into their parenting and to create more joy and connection in their families. In fact, the common theme running through the overwhelmingly positive feedback on the class was that parents only wished it was longer; so for the second round, beginning on September 19th, the class will be nine-weeks long. I can’t wait to get started with the second round of Simplicity Parenting 101! This weekend, Simplicity Parenting 101 by Handmade Parenting is generously offering all SouleMama readers $75 off the cost of Simplicity Parenting 101. Use coupon code SimpleSoule through midnight PST on September 14th to take advantage of this discount. Greetings from Lavender’s Blue Homeschool! Kelly: The new Second Grade curriculum was just released a few weeks ago! I’m SO excited to get this project out into the world. This complete Waldorf-inspired curriculum is designed to give parents a huge amount of guidance and support. It includes fully planned out main lesson blocks, circle times, really in-depth information on how to teach, and more...all lovingly crafted and beautifully integrated. You can find all the details on the new curriculum (and a sample download, including sections of the circle time) here. In honor of the brand-new second grade curriculum, today’s giveaway is the whole Lavender’s Blue curriculum package! The winner will receive copies of Kindergarten, First Grade, AND Second Grade (in digital format)! This curriculum is designed to help you thrive as a Waldorf-inpired homeschooler. It includes detailed and thoughtfully crafted lessons with stories, illustrations, full circle times (recorded on audio), and loving, guilt-free support. To enter the giveaway, please let us know why you would like to homeschool with Lavender’s Blue in the comments below! I have looked at your website several times and would love to have your curriculum! Thanks for creating it! Oh Ani, we need to cut your bangs! Only one would never really know that for certain because not only does she despise the hairbrush, but this girl is always in motion and so I never can be sure exactly where those bangs sit on her face. Whether running or dancing, cartwheeling or summersaulting, she is always on the go. And each and every (one-sided) conversation with her resembles more of a performance art piece, really. Moving, moving, moving. She'll be starting modern dance this fall with a fabulous teacher we all love dearly who has now had all of the Soule kiddos in her classes and I can't wait to see what Ani does with that in her repertoire. I can't quite imagine a more perfect match really (she gave classical ballet a try for all of twenty minutes and decided that structure was most decidedly not for her). Oh, my girl. Yet for all of her wildness, she's as sweet as sweet and tender as can be. And oh, this girl loves animals! She talks often of people's spirit animals and she dreams of them nearly each and every night (which we all are entertained by the stories of at the breakfast table). She helped me make her cousin a dress out of this fabric back during our ski sewing days last year (is she really joining the ski crew on the slopes this year? She is! ), and she has not stopped reminding me that she needed one too. At long last, I got around to it this week in some pockets of time that seemed just right for such a thing. It is, of course, a Geranium Dress. The bodice is a cotton muslin that I dyed earlier in the year. And the skirt fabric is Anna Maria's pegasus. which is pretty spectacular, is it not? We all love it lots. And it's just right for summersaulting, cartwheeling, dancing, storytelling and everything else that Ani does in her days. So very many things, in motion. One foot in, one foot out of summer, that is. Or maybe it's one foot in and the other out of autumn? I do not know what I'm trying to say except that it most definitely feels as though we are straddling both seasons heartily right now! We kicked off the long weekend with the first cross country race of the season, and I wrapped it up by arriving in Burlington, Vermont just in time for the sunset on Lake Champlain, to be followed by some Taproot work. Somehow, in between all of that, we harvested forty broilers, canned a good deal of tomato soup and sauces and then harvested even more tomatoes, managed to make some art and do some painting (on paper and walls), and otherwise completed some house and farm work that comes with the season. September is a wild one for us - as the bulk of the garden harvest needs preserving, as we look at the wood pile and see just how much more needs to be done before the snow flies, as school starts for one, a ballet is wrapped up for another, and activities and classes for the rest. And then we toss in two birthdays and an anniversary and a week away for the fair and two back to back Taproot issues and oh, I'm getting ahead of myself. Because September also holds a whole lot of beauty and wonderful peace. These last trips to the beach, which more often than not are empty of people. Dinner outside in the most comfortable of weather. All the adventures to come in this amazing month of September! Wishing you and yours the very same this September! Greetings from Mindful Clutter Clearing: Fall Workshops! Each fall workshop is three weeks long, and includes daily written lessons (with breathing space over the weekends), podcasts, workbooks filled with juicy questions and exercises, and a (totally optional) private Facebook group where we can gather online. First up, Mindful Style is a three-week journey into the heart and soul of style, from September 19 - October 7. This is an opportunity to clarify your style, gain confidence in your unique point of view, and infuse your home and wardrobe with more of what truly resonates with you, while letting go of what's not authentically you. We will be talking about wabi sabi and imperfection, the psychology of color, and so much more. In Deep Storage Boot Camp, which runs from October 10 - October 28, we will be using mindfulness techniques and gentle, emotional support to finally tackle one 'deep storage' area of your choosing, such as an attic, basement, garage, closet, storage unit, or a packed-to-the-gills spare room. Learn how to overcome the fear of getting started by breaking down the work into doable mini-bites, handle items (like photos and mementos) that bring up intense emotions, and strengthen your decision-making 'muscle' so that your clutter clearing work can become quicker and easier. Crafting an Intentional Life is a blissful 3-week adventure to awaken your heart, running from November 1 - November 21. In this 3-week e-course, we will be giving ourselves the gift of a 'sacred pause' in the midst of our busy lives to reflect on where we are and where we've been, tune into what our hearts are telling us we need more of (and less of), and craft intentions for the path ahead. From the aerial view to the macro-detail, we will be examining all of the facets that make up our lives...challenging assumptions, broadening our minds, and allowing ourselves to dream wild and free. Laura: Mindful Clutter Clearing began as a single e-course (and it's one I will offer again in the new year) but through teaching it, I realized there was so much more growth and juicy life-changing stuff coming out of it than the course title suggested. Students were not only clearing clutter from their homes, but also from their lives, making huge shifts like changing career paths and living situations...big stuff! So it felt natural that the three new e-courses I am offering this fall took root and grew from that experience. Also, I'm thrilled that all course content will now be delivered directly to your inbox as a beautiful email, so no more special passwords to remember or websites to visit...you can grab your morning coffee and the day's lesson will be waiting for you when you check your email. So much simpler! In addition, Mindful Clutter Clearing: Fall Workshops would like to offer all SouleMama readers a 10% discount on any e-course when you register before September 12. Choose your course (or courses!) here and enter the code SOULE16 at checkout. Oh my gosh! This sounds like a divine breath! Thanks for offering these courses. Please enter me in the giveaway! Am most excited about the first course! I am close to finalizing my divorce - will be moving into a new space with my 2.5 year old daughter, Betsy, and have been pondering/puzzling over/struggling to answer some of these questions about our new home together. I want it to be a restful, peaceful sanctuary for us both after a harrowing season and I want it to be reflective of us and of the values I hope to instill in our little family. I'm beginning this journey of asking what *I* want -and gaining clarity around and confidence in those answers. This would be such an adventure and provision as I get started! Exploring educational options for your family? Check out Oak Meadow’s flexible, creative homeschooling curriculum for kindergarten to grade 12, or enrollment in their teacher-supported distance learning school. The K-8 curriculum is child-centered, experiential, playful, and nature-based. High School offers challenging courses, exciting options for earning credit, and college counseling for teens who wish to pursue their passions and interests while earning their diploma. And for parents new to homeschooling, Oak Meadow offers a new online teacher training program, Foundations in Independent Learning. Ready to make a change this fall? Visit Oak Meadow’s website to learn more, or call 802.251.7250 to speak with one of our ​friendly and experienced educational counselors. ​$150 gift coupon to use in the Oak Meadow Bookstore plus choice of our new Homeschool Parent Planner (for parents of students in grades K-4) or Student Planner (for students in grades 5-12). We love Oak Meadow. Thank you for this opportunity! I'm so pleased to welcome the following Sponsors for September! Alena is the author of three books on creativity and beloved teacher of the art-making process, both online and at select retreats. Her work has been featured in numerous magazines and publications, as wells as Good Morning America and ABC Studios. Alena is also a flower essence practitioner, along with being a Reiki master and energy healer. Through grace and intuitive guideposts, she calls the beautiful town of Asheville, NC her home. As a teacher, her intention is that each participant leave a little more transformed, content, and open to wild possibility. Lisa Weiner teaches parenting classes on a wide variety of topics, leads workshops at schools and conferences around the country and works individually with parents to create positive changes in their families. Lisa's style is friendly and warm and her work is informed by her love of the home arts, Waldorf education, the Simplicity Parenting movement, her appreciation of humor and her continuing studies at the Neufeld Institure. Lisa has also completed Levels 1 and 2 of HANDLE training. Coming up this September is Simplicity Parenting 101 a nine-week online class that consists of daily videos, worksheets and articles, along with weekly live group coaching calls and live office hours. This class is fun, transformative and down-to-earth; applying theory to the practicalities of day-to-day parenting. Parents who have taken SP101 often feel that it is the best thing they have ever done for their parenting and their families! 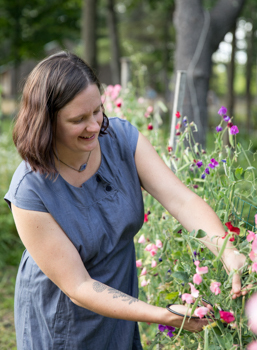 Sam Cheeney and Sasha Alsop have been growing garlic for the last decade on their small organic farm in coastal Downeast Maine. They are a certified organic farm and screen for pathogens every year. They grow 11 varieties ranging from standard homestead varieties, like Russian Red and Music to heirloom varieties like, Phillips and Orchard Hill Purple. They sell online and at the Common Ground Country Fair. Check out their website or sign up to start receiving emails about their organic seed garlic. Scratch is a new brand new craft supply retailer and makerspace in New Hampshire's Upper Valley region that focuses on fine arts and traditional handcrafts. We're committed to enabling the maker in all of us. Inspired by nature's seasons, Annie Bryant is a storyteller and musician who creates magical tales and sing-along songs that celebrate the natural world. Available as CDs or audio downloads, The Seasonal Collection contains more than 2 and half hours of stories and songs to inspire wonder and joy in your family home. At Winterwoods Tea Company we're passionate about creating artisan, farm-to-table loose-leaf tea blends using the finest local and certified organic ingredients. We begin by sourcing our ingredients from small, sustainable organic farms and companies who support our values and we hand-mix each of our original tea blends in the beautiful Pacific Northwest. The result? The freshest herbs and spices that go from farm to tea cup. Straight up all natural tea full of artisan goodness. Woolen Moss is a women's clothing line designed and produced in Upstate New York. We carry a regular line of organic cotton/bamboo clothing, as well as our favorite, organic merino wool clothing. This year’s wool was grown and processed according to Oeko-tex standards in New Zealand. Clean, warm, and lovely colors in a new light weight drapey jersey. Enjoy!